Of course, last week I was in Las Vegas. I was dreading the possibility that I had to do uploading / downloading from a hotel connection. 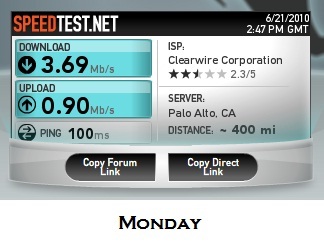 Last year, I paid $14.95 a day for 512 down / 256 up on average. Not great if you need to push video for a major event. Terri from Ivy Worldwide turned me on to Cheetah – a local company that rented 4G cards using the Clear 4G network. Their website – 4G4rent – went through the steps – rent the service (pre-pay), they drop the card off at your hotel. Use the service, then when you check out, you leave the card at the front desk. Pretty simple. What was better, though, was the price. I purchased the service from Sunday to Friday and it only cost me $54.00. That was $9 a day. There were times I was getting 4-6 MB download and up to 2 MB upload. Whether I was up in my room or down in the lobby, the signal worked fine. The airport did have some connection problems, but I would attribute that to distance. Hotel Internet – Room specific, connect via cable. Some rooms had wifi, but only in the general vicinity. $14.95 a day for 512/256. This was a no-brainer. 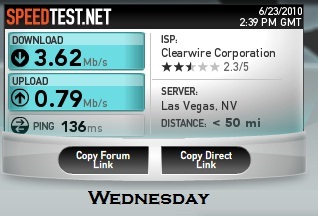 The 4G card out-performed the hotel internet hands down. I was able to upload video in a timely manner and get work done. 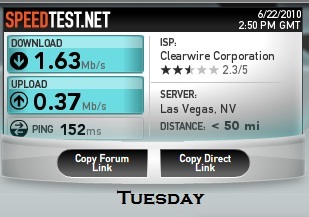 Clear 4G WiMax was always on and worked like a champ. It’s only too bad they don’t have 4G in my market at home. I can think of many times I could use the service. But I know they are announcing new areas soon and will hopefully be in the Madison market by 2012. In the meantime, this card was a well needed addition to my arsenal. I will definitely be renting here again.